Terrence Tullgren tells the fresh and inspiring story of a shy young boy who learns the value of taking responsibility for his actions. While rushing to school, Donnie accidentally injures his friend Billy. Donnie’s mother reminds him of how the deer near his home helped each other after an accident. Donnie resolves to help his friend recover. Donnie learns that, even when he makes a mistake, he can still find ways to make amends. 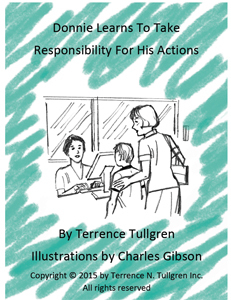 The book helps young children understand the importance of accepting responsibility. The story is beautifully told, in words any child can easily relate to. The pencil-line, retro illustrations by Charles Gibson hearken back to a time of old fashioned values as they skillfully complement the text and reinforce this important lesson. The cover intentionally features black and white images so that the reader has no preconceived notion of how to color within, therefore fostering each child’s innate creativity and imagination. The result is a must-own book for any child. Tullgren weaves a story both touching and impactful for young hearts and minds. Donnie Learns To Take Responsibility For His Actions is the seventh book in the Donnie Learns series on values for young people. Copyright © 2019 Donnie Learns . All Rights Reserved.